Well. Its getting close, the lead keel is all trimmed and tidied, the casting flash all planed off with the cheap Chinese power plane (it took two to do the job, but at $40 they are good value, the Bosch one lasted less time than the cheapie) and smoothed with the auto body repair rasp, the holes are bored straight where a couple of the cores floated and moved, and the forward end sawn to a taper with a hand saw (I suspect a ripsaw would have worked better than the crosscut but no way was I going to offer my good Disston for that). 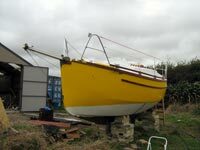 The casting was slightly off straight due to a bit of moisture in the mould timbers, but a few whacks with a 12 pound sledge hammer has fixed that, a little filler on the top to give a nice flat surface and the keel is all done. 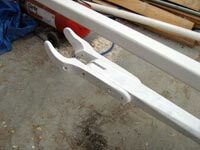 Meanwhile, there have been lots of bits bolted to the boat; some are just a matter of drilling a couple of holes, proofing the holes with that 2 part epoxy primer and then bolting it down. 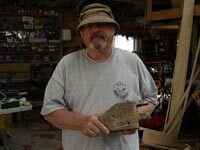 Some require some fiddling to get it angled and positioned just right, and some, like the inner end of the bolts that hold the middle rudder gudgeon require some surgery to gain access. In this case there is now an access plate in the bottom of the lazarette at the back of the cockpit. 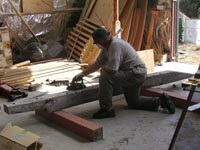 The boat has been jacked up and sat on blocks, high enough to slide the lead under, jack it up and sit it in its rightful place, then get a big drill in under it and drill upwards to the pocket bolts that take the ends of the bolts. 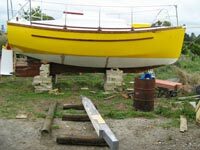 The main keel bolts don’t come down through the lead, they just hold the deadwood together and separate shorter bolts hold the lead, less chance of leaks that way. Charlie has the mast assembled, a 7.2m piece of marine alloy flagpole, 100mm x 3.2mm wall with big wooden plugs in the ends, much quicker and cheaper than making a wooden one. It’s impressively big, and I’ve got to get on and draw the shouldered fittings that take the upper ends of the stays. More hardwood and bolts. 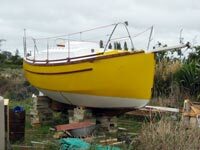 It’s a wet weekend as I write so working on the boat outside is out. Its been more rigging work today, figuring out how to make the reefing combs and the mainsheet hanger on the boom and how the multi part halyards connect to the gaff. 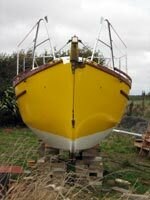 With the bowsprit on and its bobstay and whisker stays in place it looks great. 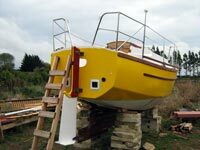 There is no climbing on the boat until we get the keel jacked up, bolted in place and the boat lowered back down, but each little job done brings the day when the truck with the low loader comes through the gate. She’s looking good, and there is discussion of routes, seasons, and such, we’ve both read stories of sailing and cruising in the Straights of Magellan (hoo boy, go buy some WARM underwear) and there are little things like electrical wiring, the guide from the chain locker up to the navel pipe, more lockers cut into the cockpit sides and a myriad little things. 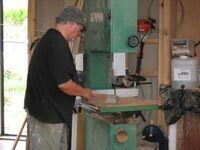 It’s a busy time, and some days there is a lot to see for the work, sometimes he works all day, comes away all sweated up and red faced with nothing appearing to change. But its coming on, and very soon there will be a truck here with a crane and a lowloader ready to pick her up and head off over the hill to Tauranga and salt water.